At a point in most angler’s fishing careers, it becomes time to graduate from using entry-level equipment and start using things that are more appropriate for a skilled, experienced angler. These types of gear usually have features that only a seasoned angler will appreciate, and they usually cost a bit more than the gear made for beginners, as experienced fishermen and fisherwomen are generally willing to invest more on the tools of the trade. For some anglers, this may mean purchasing higher quality rods and reels, or perhaps investing in a collection of lures that cost far more than most beginning anglers are willing to spend. But one of the best ways to elevate your fishing to another level is by purchasing better electronics. In terms of return-on-investment, there may be no better way to spend your money than upgrading your fish finder. This doesn’t mean you must purchase the most expensive models on the market; often, fish finders in the mid-price range include nearly everything an advanced weekend angler would want. The Garmin STRIKER 7cv is an excellent example of just such a unit, and it comes in at the bottom end of this price range. This places it well within the budget of most serious anglers, and gives them a chance to find – and therefore catch – more fish. Based on the litany of features it possesses, the intuitive way in which it functions and the size and quality of its display screen, the Garmin STRIKER 7cv gets an A- rating from Fishing Tech. While most modern fish finders in the $400 to $600 price range include GPS circuits, this doesn’t reduce the value of such a feature. GPS technology is one of the most helpful tools in an angler’s arsenal, and the information it provides works hand-and-glove with the basic information fish finders provide. The STRIKER 7cv not only provides data about your location, it allows you to navigate via waypoints (which also means you can mark productive spots and return to them later) too. Additionally, the included GPS unit means that the STRIKER 7cv displays your travel speed right on the screen. In addition to traditional sonar technology, the Garmin STRIKER 7cv’s transducer uses CHIRP technology to explore the water column. Unlike traditional sonar units, which emit pulses comprised of only a single frequency or two, CHIRP transducers sweep across a range of frequencies. This means that the fish finder collects much more data, and can therefore produce a much more detailed image. In fact, thanks to its CHIRP technology, the Garmin STRIKER 7cv can produce nearly photographic-quality images of the world below your boat. This means that you don’t have to target some unidentified piece of structure below your boat – you can target a specific branch of a specific tree. Most anglers probably use the Garmin STRIKER 7cv while moving slowly, but the model also excels at stationary, vertically-oriented fishing, thanks to the included flasher circuit. With this mode engaged, you’ll be able to concentrate on only the water directly below your boat, allowing you to target the specific fish you are trying to catch. This is extremely helpful for ice fishing (be sure to add the ice fishing bundle if you plan to use the STRIKER 7cv in that manner) or vertically jigging. In fact, you can even visualize the bottom, your target fish and your lure while doing so. 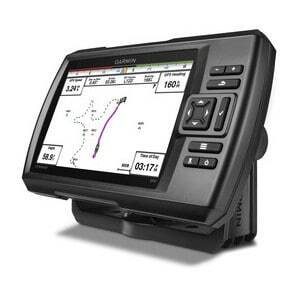 The Garmin STRIKER 7cv is a well-made fish finder that comes packed with a variety of impressive features. Some of the unit’s most notable characteristics, capabilities and features are detailed below. In order to leverage high quality transducer technology, the Garmin STRIKER 7cv features an HVGA 800 x 480 color display. This makes it easy to see fine details of the water below and ensures that you can see fish arcs and structure clearly, in just about any weather or conditions imaginable. The Garmin STRIKER 7cv makes it easy to view two different types of information at the same time, thanks to the included split-screen zoom function. When activated, this function allows you to view a number of different combinations of screens, and you can zoom in on either half of the screen independently. Good fish finders must be able to handle a small amount of water splashing, or they’d fail on their first trip aboard a boat. Most manufacturers make their fish finders minimally water resistant, but Garmin takes things farther and seals the STRIKER 7cv well enough that it earns an IPX7 water-resistance rating. This means your STRIKER 7cv will withstand rain or snow, and it can handle being submerged for up to 30 minutes. ClearVu is Garmin’s proprietary version of a scanning sonar. With this, you can image things below your boat in otherwise-impossible detail. Note that earlier versions of the STRIKER series used the name DownVu for this same technology. Accordingly, you may see older models with the dv, rather than cv, suffix. It can often be difficult to find fish while traveling at high speed, but thanks to the STRIKER 7cv’s Ultrascroll mode, you’ll be able to do so easily. The STRIKER 7cv’s Ultrascroll function causes the screen to progress more quickly by reducing the image quality slightly. This will help you spot schools of fish while cruising over the surface at relatively high speeds. Like any other electronic device designed to help you catch more fish, the Garmin STRIKER 7cv has its share of strengths and weaknesses. The best way to judge the value of any fish finder is by comparing it to other models made by the same manufacturer, as well as comparing it with similarly priced and equipped fish finders produced by other manufacturers. The Garmin STRIKER 7cv is the penultimate model in the STRIKER series, with only the STRIKER 7sv being superior. The STRIKER 7sv comes with all of the features the 7cv has and it includes the same type of display screen. However, the 7sv provides one important feature the 7cv does not: Side-view sonar. Side-view sonar allows you to image things beside your boat, rather than only those things directly below you. This can be very helpful for scouting out large amounts of water in a short period of time. On the other hand, if you’d like to save about $100, and you don’t mind giving up about 2 inches of screen size, you could downgrade to the STRIKER 5cv. The STRIKER 5cv provides almost all the functions and capabilities that the STRIKER 7cv has, so you won’t miss out on much by doing so. See our Garmin STRIKER 5cv review. The two fish finders that are arguably the most similar to the Garmin STRIKER 7cv are the Humminbird HELIX 7 and the Lowrance HOOK-7. Both units include a number of the same capabilities and features that the STRIKER 7cv does, including things like CHIRP technology, down-imaging capabilities and a high-quality 7-inch display screen. However, both the Lowrance HOOK-7 and the Humminbird HELIX 7 feature one very important thing that the Garmin STRIKER 7cv fails to: Chart-plotting functionality. This is a significant difference, as it means the Lowrance and Humminbird models are far superior for navigating around the water than the Garmin model is. However, not all anglers require extensive navigation capabilities, and this may not be important to you. See our Lowrance HOOK-7 review and our Humminbird HELIX 7 review. If you are tired of squinting to see your fish finder display, or you are looking to upgrade to a CHIRP- and GPS-capable fish finder, the Garmin STRIKER 7cv is hard to beat. It features almost all of the things comparably priced fish finders do, and it has a very high-quality screen, which provides incredible visibility when combined with the included tilt-and-swivel mount. Although we’d have preferred to see it include chart-plotting functionality, there is little else this unit fails to provide. Based on these factors, the Garmin STRIKER 7cv easily earns its A- rating from Fishing Tech, and it will leave most anglers very happy with their purchase.